We all know how good Waterpik are when it comes to oral irrigators. So, why should we expect anything less from their electric toothbrush? The SR 3000 is powerful, stacked with features, and ready to compete with Sonicare. If you are looking for water flossing then Waterpik is definitely the best company in the space. But, what many people don’t actually know, is that Waterpik also makes electric toothbrushes. Their Sensonic Professional Plus SR 3000 is a living proof of that. 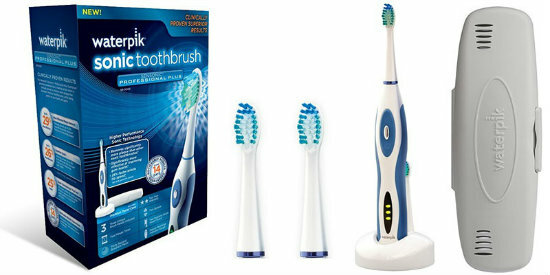 The question is, in a market dominated by Oral-B and Philips, is there enough space for Waterpik to leave their mark? This Sensonic Professional Plus is an effective toothbrush. Used the right way, it gives a great cleaning experience. The fact that It is currently being made by one of the leading oral healthcare companies, has already won this brush a lot of consumer trust. In addition, in order to be competitive, and not to fall behind, Watetrpik has made sure that the Sensonic model is packed with cool features. Speaking of not falling behind, the SR 3000 makes some bold claims. 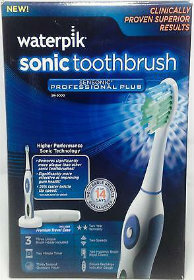 Since it is considered a sonic toothbrush, it goes in a direct gladiator match against Philips’ Sonicare models. It does so by claiming that it is 25% faster, 29% more efficient in removing plaque, and 26% more effective at improving gum health when compared to Sonicare FlexCare. I like when companies make such brave statements and say that they are supported by clinical studies. I cannot attest to the truthfulness of the information, but I know such competition is good for the industry and the average consumer. It helps keep everyone on the edge and pushes companies to become more innovative. Here is a quick overview of the good and the bad. Change in brightness in teeth can be seen within 14 days. Extra heads which are soft and round bristles included. Cleans at a perfect angle with a small amount of pressure. Faster rotation and oscillation than most electric brushes. Some customers complained that they battery only lasted about a year. Low build quality, the body wears off very easily after everyday use. The handle of the Sensonic is very sleek in design, and it is overall aesthetically pleasing. With competing brand toothbrushes being rather chunky pieces of plastic, the SR 3000’s sleek design is definitely something to be considered during the purchasing stage. There is a blue rubber grip which goes down each side of the handle that features a curved design. This is meant to help with your fingers resting on the brush, regardless of whether you are left or right handed. This is a simple add-on, no doubt about that. But, you will be surprised how many high-end electric toothbrushes have not bothered adding this to their handles. In our tests, we have found that grip control is very relevant to the overall brushing experience. Especially, when you have a device that is vibrating at 31,0000 movements per minute. The standard brush head which is supplied along with two other heads is shaped in the style with which most people are comfortable with. The shape and size of the brush head is very similar to that of a manual brush. Thus, if you are making the switch from manual to SR 3000, the overall transition will be a bit smoother. Plus, I like Waterpik’s generosity of including 3 brush heads. 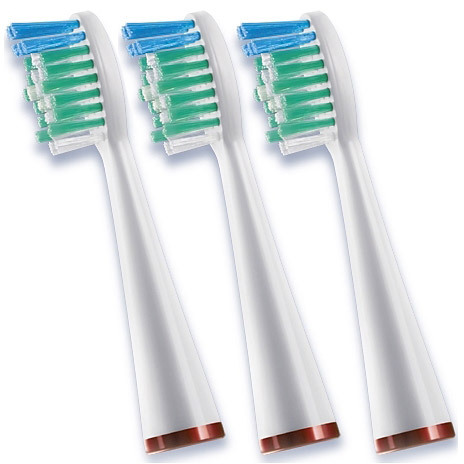 At this price point, Sonicare models come with 1 brush head and Oral-B models come with 2 brush heads. 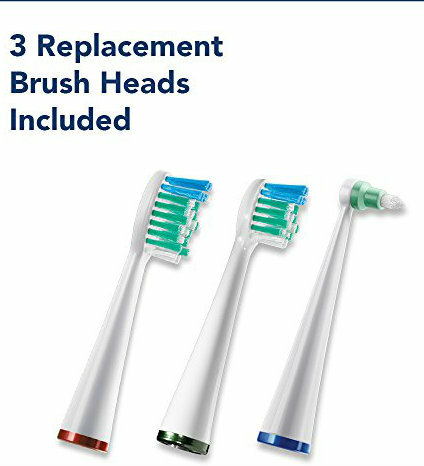 I have never been very good at math, but I know 3 replacement brush heads are better than 1 or 2 heads. The bristles on the Sensonic head are varied in height for a reason. The general idea is that the longer bristles will remove plaque from between teeth and the gum line, whilst the shorter bristles work on removing the build up from the surface. The bristle ends are rounded which gives them a more soft feel overall. This is the second type of brush head that Waterpik has provided. This one is smaller in size and it is ideal for children and adults with smaller mouths. If you are struggling with the standard brush head especially around your back teeth, then the compact brush head would give you a better overall clean. The bristles of this head are very similar in layout to the standard but on a smaller scale. All the bristles are rounded to give a softer feel to your teeth or mouth. Interdental brush head is what you never get with Sonicare and you barely ever get with Oral-B. Unless, of course, you purchase them separately. This is what I like about Waterpik, they spare no resources. They also know that in order to punch a hole in this industry, they will have to offer something more than their competitors. And, since they have been in the oral hygiene business for tens of years, they know how to get consumers’ attention. The interdental brush head gives Sensonic yet another edge over Sonicare. This brush head may not be suitable for everyone, but if you have found that you are having a buildup of plaque or bacteria, it will be perfect for your teeth. The bristles of this brush are narrow and go into a point, which will allow for a great clean between your teeth, however, this should not replace you using floss. If you are a frequent traveler, you will be happy with the fact that Waterpik have included a solid travel case. When taking the travel case from out of the box, there is a small plastic smell, but it isn’t quite as bad as the Oral-B Pro 5000 case. And, yes, I just compared plastic smells. The Sensonic case comes with four vents two at the top and two at the bottom. This is to prevent mold and mildew from building up on the inside. So, even if you place your brush inside whilst it is still wet, it won’t have any build up. Although the case isn’t dishwasher safe, you can still easily wipe it down with hot water and a clean cloth. This will help to further prevent any mold or mildew build up. The case also features slots where two brush heads and the handle can be placed, the brush heads clip into place with ease. The charging stand for the SR 3000 is fairly standard when it comes to electric toothbrushes. With a big resemblance to a white doughnut, there is a small notch on the back of the charger. This is where you can place your brush head, and it is also a place where you can store a spare brush head rather than losing it. The base contains 3 white rubber feet, this helps to keep the charger stable whilst it has the toothbrush inside. In order to stay competitive, Waterpik had to stay on top of their “features” game. The SR 3000 has 2-speed settings. Pressing the power button once will get the brush going at its low speed. This is a more gentle solution for sensitive gums. Pressing the button a second time will release the sonic monster out of the cage. The brush makes a humming sound no different than other sonic brushes. At its highest level, it will be loud enough to wake people up if they are sleeping in close proximity. But, this is nothing new when it comes to high powered electric toothbrushes or water flossers. SmarTime and QuadPacer features are included. Even though those are pretty standard not, it is good to see that Waterpik has not fallen behind in this regard. However, where the Sensonic finds itself short, is the EasyStart option that Sonicare is equipped with. This is the feature that gradually increases the speed movement of the brush head over a period of time (uses). It allows for a much easier transition from a manual toothbrush because your teeth are not exposed to the sonic waves right away. When it came to testing, the Sensonic gave a great clean overall. The wide choice of brush heads that are included with the model certainly helped with that. Here is where Waterpik has failed – NiMH battery. This is the preferred battery type for Oral-B brushes. It is an older, heavier, and less efficient battery type than the modern Lithium Ion that Philips is using in their Sonicare models. We have compared Oral-B and Sonicare battery life over and over again. Philips always wins by a margin of 30% or so. That is, their toothbrushes will last 30% (3-4 days on average) longer when fully charged. This is a big difference and a great selling point. Sensonic goes out in a head-to-head competition with Sonicare. I am puzzled as to why they will choose to go with a NiMH battery. During our testing, the battery took 24 hours to charge and only lasted 7 days. While this is normal for Oral-B, Philips toothbrushes within that price range will last you around 14 days. Huge difference!